The 74F543 Octal Registered Transceiver contains two sets of D-type Latches for temporary storage of data flowing in either direction. Separate Latch Enable (LEAB, LEBA) and Output Enable (OEAB, OEBA) inputs are provided for each Register to permit independent control of inputting and outputting in either direction of data flow. The A outputs are guaranteed to sink 24 mA, while the B outputs are rated for 64 mA. FUNCTIONAL DESCRIPTION The 74F543 contains two sets of eight D-type Latches with separate input and controls for each set. 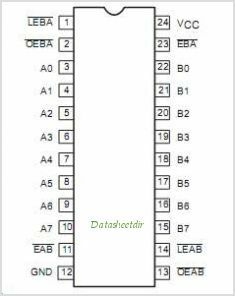 For data flow from A to B, for example, the A-to-B Enable (EAB) input must be LOW in order to enter data from A0 - A7 or take data from B0 - B7, as indicated in the Function Table. With EAB LOW, a LOW signal on the A-to-B Latch Enable (LEAB) input makes the A-to-B Latches transparent; a subsequent LOW-to-HIGH transition for the LEAB signal puts the A Latches in the storage mode and their outputs no longer change with the A inputs. With EAB and OEAB both LOW, the 3-State B output Buffers are active and Display the data present at the outputs of the A Latches Control of data flow from B to A is similar, but using the EBA, LEBA, and OEBA inputs. This is one package pinout of 74F543,If you need more pinouts please download 74F543's pdf datasheet. 74F543 circuits will be updated soon..., now you can download the pdf datasheet to check the circuits! MSM6685A, The MSM6685 Is A Serial Register Composed Of 8,388,608 Words X One Bit, Characterized By Medium- Speed, Low Power Consumption Operation.